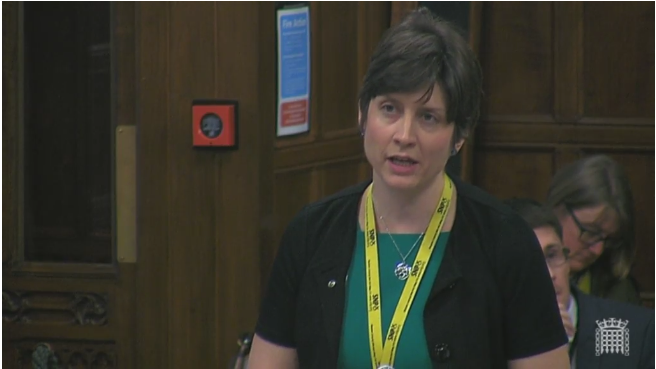 SNP MP Alison Thewliss has reacted with fury, following a Minister’s effort to shut down the debate early on asylum seekers being allowed to work. Ms Thewliss led a Westminster debate earlier this morning, which saw consensual and cross-party participation from SNP, Labour and Conservative backbenchers. The MPs were putting their case for lifting the ban on asylum seekers to work. Despite a number of attempts from MPs to intervene on the Minister, Sarah Newton, they were told that there was not enough time to take interventions or questions. The Minister then closed the debate early without addressing many of the points raised by MPs. “Today I outlined the societal and economic benefits of lifting the ban on asylum seekers working. Valid points were raised by Conservative, Labour and SNP MPs, all of which were ducked by the Minister. “I am not sure whether the Minister responding didn’t know her brief or if she was genuinely trying to shut down legitimate questions about the fallacy of the current policy. “Frustratingly, the Government merely repeated the usual right wing rhetoric we’re so used to hearing when it comes to asylum and immigration policy. “Despite a contemptable performance from the Minister today, the SNP won’t be letting go of this issue. The case for lifting the ban on asylum seekers working is both morally and economically justified. Had the Minister allowed the debate to run for the full allotted time today, she might have started to understand that”. I couldn’t agree more Alison. Could it be that there are vested interests here in NOT doing anything that enables asylum seekers to demonstrate the undoubted skills, talent and expertise that very many of them possess? Let’s face it, that wouldn’t sit well alongside the attitude that the current government seems to embrace. Heaven forbid that certain sections of the British people start to see asylum seekers as able to contribute earlier to economic development and that they could so easily be able to be financially independent of state aid.